Show Management estimates that more than 1,500 boats were on display. The expectations going in were sky-high and the Fort Lauderdale International Boat Show more than lived up to them. Helped by ideal weather (South Florida was at its autumn best), the Oct. 30-Nov. 3 show attracted about 100,000 people. Exhibitors say they encountered little of the economic uncertainty that has sidelined would-be buyers in recent years. The show is a major economic engine for the city and the region, where boating last year was an $11.5 billion business. “I love this day, I love this weekend, I love this event,” Fort Lauderdale Mayor Jack Seiler said in his opening-day welcome. As always, the show was a launch pad for new products, including a $10.5 million 92-foot flagship from Viking Yachts. Smaller boats got plenty of attention, too — particularly those in the larger (25 to 43 feet) outboard range, where sales are increasing at a rate of 25 percent a year. Executive editor Chris Landry, managing editor Rich Armstrong, senior writer Jim Flannery and Trade Only contributor Theresa Nicholson give their impressions of the big show. The mood was buoyant, the sales forecasts were upbeat and the weather was as warm and inviting as South Florida hospitality gets — blue skies, blue seas and no snow. 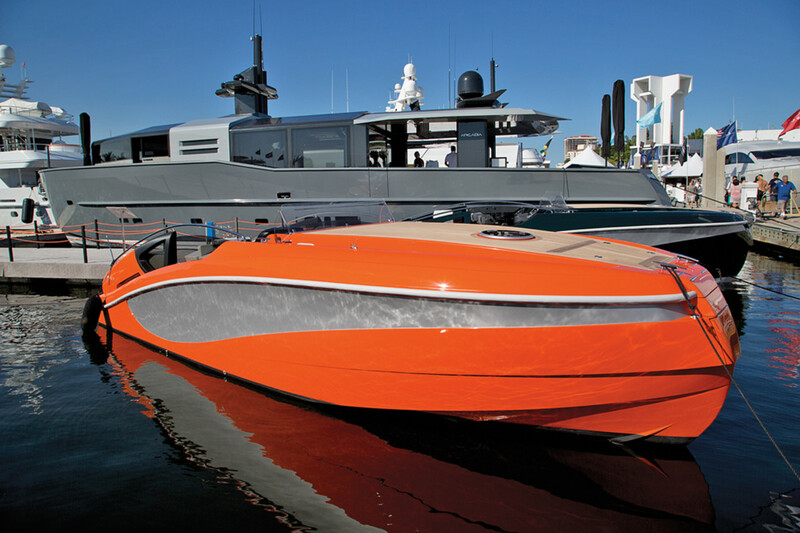 Those were all of the ingredients that Efrem “Skip” Zimbalist III needed just before the opening of the 2014 Fort Lauderdale International Boat Show to predict that it would be the “biggest and best in a long time — one of the top three.” And so it was. 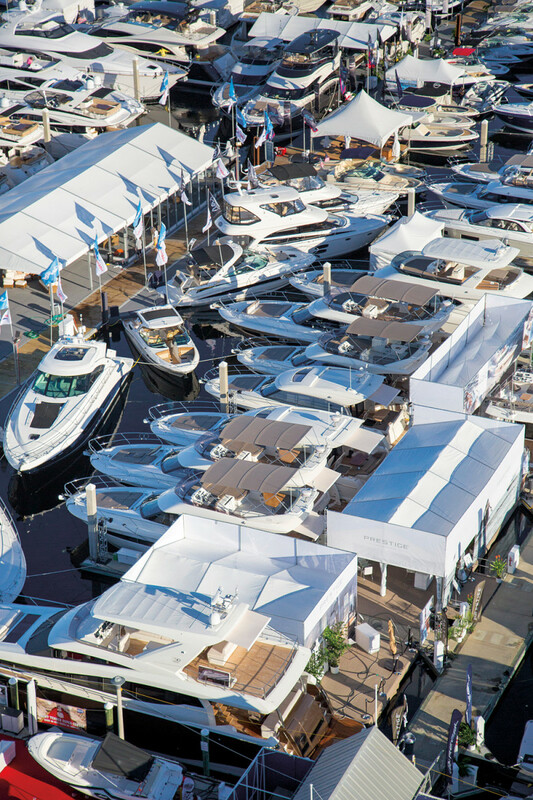 Zimbalist, CEO of Show Management, the event’s producer, says more than 1,000 exhibitors from 30 countries were there, and Show Management estimates that more than 1,500 boats were on display — the best showing since before the Great Recession. Attendance was about 100,000, up 6 percent from last year for the Oct. 30-Nov. 3 event. The turnout was the highest since 2006, signaling that consumers are getting the itch to buy again. Boston Whaler president Huw Bower introduces the 420 Outrage. This year’s edition — the 55th — premiered a freshly refurbished Pier 66 Marina as a seventh show venue. The iconic 127-slip marina on 17th Street just completed a $20 million renovation that included new bulkheads, 3,600 feet of floating parallel dockage, fixed docks, electrical power for superyachts, a dockmaster’s office and a captain-and-crew clubhouse. “Pier 66 marina is brand-new,” Zimbalist says. European exhibitors, more bullish on America than on their faltering economies back home, were at the show in numbers. Introductions of new boats — and new technology — were returning to pre- recession levels as builders put their best foot forward in a rebounding market. And, yes, boaters were opening their checkbooks. Among the launches was Viking Yachts’ flagship 92 Convertible, a $10.5 million sportfisherman that company president and CEO Pat Healey calls the “crown jewel” of the Viking fleet. Healey introduced the yacht at his September dealer meeting, and by the opening day of the show, he said he had sold seven of them. Gerald Berton, president of Yacht Controller, which makes a remote hand-held wired joystick unit for controlling a boat, introduced a wireless version of that joystick, Fusion. The timing couldn’t have been better. “We had a great show, which resulted in a 50 percent sales increase over last year,” he says. The opening day press breakfast on the superyacht Florida Princess at the Bahia Mar Resort and Yachting Center underscored the optimism with some interesting insights into the rebound. Economist Murray, the author of a 2014 Marine Industries Association of South Florida study of the boating industry in Miami, Dade and Palm Beach counties, reported that marine sales grew 36.3 percent in the tri-county area and 31.3 percent across the state from 2010 to 2014. “No question,” he says, “there’s been a steady rebound over the last four years,” sluggish at first but more spirited since 2012. Murray says the tri-county marine industry generated a total economic impact of $11.5 billion during Florida’s fiscal 2013-14, which ended June 30 — an increase of $2.6 billion from 2010. That figure includes $4 billion in wages and economic activity supporting 136,000 jobs — up from 107,000 four years ago. The tri-county region accounted for 51 percent of Florida’s marine sales of $4.675 billion in fiscal 2013-14. Broward contributed the lion’s share at $1.5 billion, followed by Palm Beach, $586,317,556; Pinellas on Florida’s west coast, $332,397,708; and Dade, $332,397,978. With multipliers, the industry in South Florida generated a total economic impact of $11.5 billion in the region, compared with $8.9 billion in 2010. The Fort Lauderdale show alone contributes a half-billion dollars a year — more than a Super Bowl — to the regional economy, says Murray, who has studied the show, as well. “The show is a huge catalyst,” he says. The figures highlight the marine industry’s importance to the region’s economy and the state of Florida, he says. To drive that point home at the press breakfast, a short video co-produced by MIASF and Active Interest Media (the owner of Soundings Trade Only) and narrated by golfer Jack Nicklaus talked about the marine industry’s history in Florida and its role as an economic engine. In a state where jobs and the economy have been at or near the top of just about everyone’s political agenda, the video is expected to be a useful tool for reminding legislators and regulatory agencies of the industry’s role in Florida’s future. MIASF executive director Phil Purcell says the video will “educate people” about the industry and about the importance of investing in infrastructure to promote its health: dredging on the Intracoastal Waterway, expanding the city’s Las Olas Marina, rebuilding the convention center — with a marina this time. “Now is the time to build the marine industry’s brand, not just our individual brands,” he says. Also speaking at the breakfast, Fort Lauderdale Mayor Jack Seiler said the marine industry is one of three pillars of the South Florida economy (the others being real estate and tourism), which are beneficiaries of the show. Many who visit Fort Lauderdale to buy a boat also buy property, and the show is a major tourism event. Boats filled every square foot of space available. With Pier 66’s marina back on line, the show hosted nearly 200 boats over 100 feet this year — quite an accomplishment, says Andrew Doole, Show Management’s senior vice president and COO — but just as newsworthy was th–e “dynamism” that Zimbalist noted in the market for boats under 60 feet, which was the subject of a panel discussion at the press breakfast. Sales of boats 11 to 45 feet numbered 55,000 in 2005, shrank to 16,000 in 2009 and increased to 23,000 in 2014, says Boston Whaler president Huw Bower. Currently sales of 25- to 43-footers are increasing at a rate of 25 percent a year as sales increases for boats under 23 feet remain in the single digits, he says. Sales of larger boats in this category are on a roll. “What’s driving that?” Soundings editor-in-chief William Sisson asked the panel. The vision and expertise of the playmakers in the most successful companies in this segment has to be part of the answer, he says. Jupiter Marine vice president of sales Todd Albrecht says he sees more younger folks — in their 40s — stepping up to Jupiters today and some older boaters stepping down from big sportfishermen to his larger outboard-powered boats, which top out at 41 feet. Millennials and young athletic types are buying Scott Deal’s flats boats, and baby boomers are keying in on his larger, more comfortable Cobias, says the Maverick/Hewes/Cobia president. Outboard boats are getting bigger. They are carrying more and bigger outboard units that are increasingly sophisticated and reliable. They offer comfortable cabins. They’re multi-use now, not just for fishing but also for water skiing and day cruising. They feature new technology for a younger demographic. And they’re sociable, for gathering the clan. “The reason people boat is to spend time with friends and family,” Bower says. That’s good news for an industry that took a big hit in the Great Recession, but Murray’s economic study suggests that although marine sales clearly are on the rebound, they aren’t back to pre-recession levels. 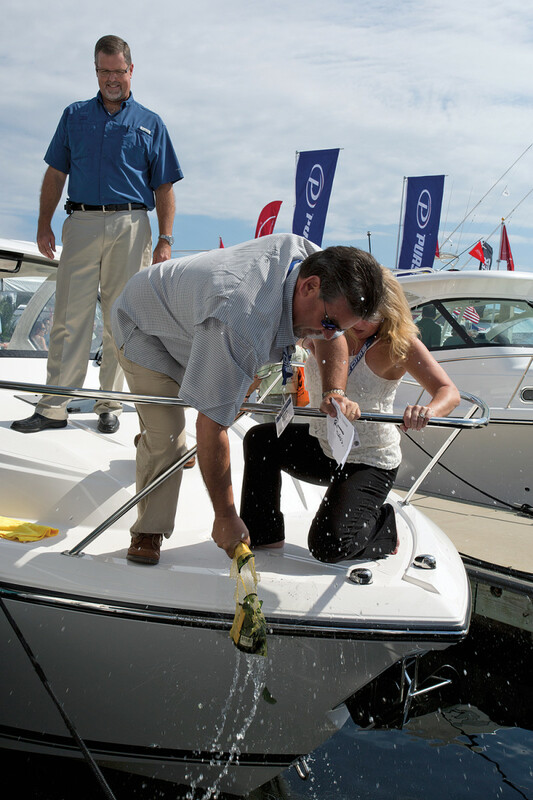 Florida boat registrations in 2006 numbered 988,652 — 12.5 percent more than there were in 2013. And in 2006, Florida marine sales were $6,229,057 — 25 percent more than the $4,675,843 tallied in fiscal 2013-14. Murray attributes this to changes in both the nation’s demographics and its economy. Still, the news at the show was mainly good. Murray says for every marine job gained in a recovering economy, many more non-marine jobs are created because of a multiplier effect as wage earners spend their income locally to pay for groceries, health care, movies, plumbers, whatever. The big names produced some big news at the Fort Lauderdale International Boat Show this year, with boat introductions from Sea Ray, Tiara/Pursuit, Viking, Boston Whaler, Chris-Craft and Four Winns. I attended press events for all six of these builders. Interestingly, most of the new boats emphasize the openness of topside layouts and interior living spaces. Boat companies are building larger open boats — whether they are dual consoles or center consoles or bowriders — and more cruising boats with super-sized, family-friendly flybridges. Responding to market demands, builders also are packing their boats with more technology, creature comforts and living conveniences. They’re also brightening their interiors with large windows and more vibrant colors. And the outboard engine continues to gain more market share. S2 Yachts has been bolstering its fleet of innovative, modern boats for both Tiara and Pursuit. The Holland, Mich.-based company introduced the Pursuit OS 325 Offshore, which is built on the same hull and uses the same outboard propulsion (twin Yamaha F300s) as the Pursuit DC 325 Dual Console. Pursuit also builds the DC 235 and 265. The DC 325’s strengths include wraparound bow seating, consoles for a head and a lounge/storage area and weather protection, along with an entertainment center with an optional electric grill. “It has tremendous openness from the bow to the stern, and if you need to duck out of the sun or rain you have a full windshield that is integrated with the hardtop,” says David Glenn, marketing director for S2 Yachts. 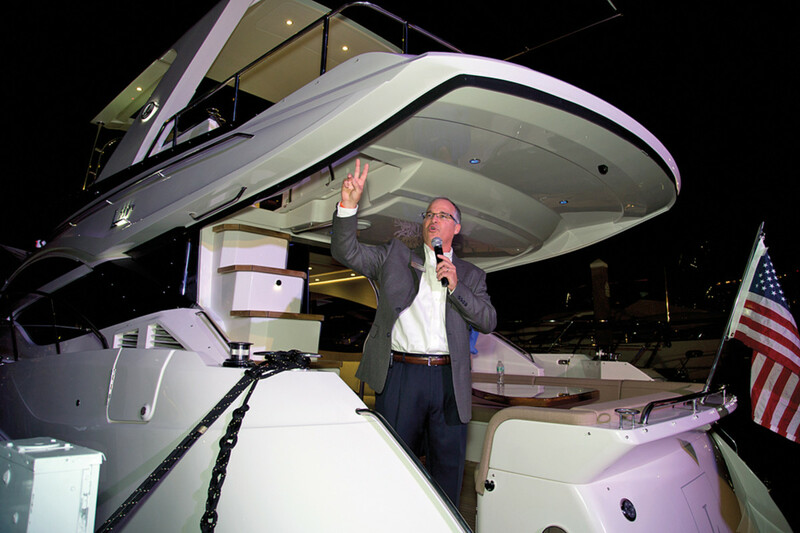 Sea Ray president Tim Schiek was touting the features of two new flybridge yachts in the Sea Ray lineup. The Offshore model has a full cabin (instead of an open bow, like the DC) and a hardtop. But it was the large, gin-clear windshield (similar to those on the Pursuit SC 365i Sport Coupe, Tiara 50 Coupe and 44 Coupe) that caught my attention right away. The Tiara 44 Coupe, which was introduced to the media in August, and the Tiara 50 Fly also made their boat show debuts. Chris-Craft debuted its largest Catalina model, touting its high-end standard equipment and innovative seating. The Catalina 34 joins the 23, 26 and 29 in this fleet of luxury center consoles. The boat has a two-person berth and a head in the console, along with clever fold-out cockpit-side seats that join the transom seat to form a wraparound settee. A centerline sunpad folds out in the bow. She’s powered with twin 350s or triple 300s, and standard equipment includes a dive door, hardtop and cockpit sunshade. Another must-see introduction was the Boston Whaler 420 Outrage — “the largest, most complex and most innovative Boston Whaler ever built,” Whaler president Huw Bower said as he stood on the foredeck of the mammoth center console. Four 300-hp Mercury Verados power the center console. It’s the first Whaler to run with quad outboards. Three helm seats and a separate leaning post directly aft provide room for six people. A windshield that extends to the hardtop and side windows surround the helm station. The demo boat was equipped with a tower with a second helm. The bow has U-shaped seating with pop-up, forward-facing seatbacks and a powered pedestal table. The cockpit has a cushioned bench seat at the stern that flips down. The cabin has twin hull-side windows, a V-berth, a head with a shower, a settee that converts to a berth and a galley. A new 32-footer introduced to the American market by Wilder Yachts USA. Four Winns debuted its Horizon 440, a 44-foot open-bow express powered by twin Volvo Penta IPS600 pod drives. “It’s the largest bowrider on the market,” says Christophe Lavigne, vice president of engineering for Rec Boat Holdings, parent company of Four Winns. The boat combines an open bow design with a full cabin, express-style hardtop and hydraulic swim platform that can hold a personal watercraft. Four Winns also unveiled the 35-foot Horizon 350, also a bowrider, powered by twin MerCruiser High Output 430-hp 8.2-liter sterndrives. It has a port-side cabin and transom seating that converts to an aft-facing sunpad/chaise lounge. Sea Ray rolled out six boats. The new flybridge model — the Sea Ray L590 Fly — grabbed the spotlight during a gala Sea Ray hosted on the show’s first night. Sea Ray president Tim Schiek later told me he thinks the L650 and L590 Flys are the best boats Sea Ray has ever built. Both are part of Sea Ray’s L-Class motoryachts. Viking says it is the largest sportfish ever built in the United States entirely with resin infusion, which results in a lighter, stronger boat. The 92 features a climate-controlled enclosed flybridge, custom tuna tower and six staterooms, each with its own head. Twin 2,600-hp MTUs power the $10.5 million yacht to a top speed of 36 knots and a cruise speed of 32 knots. The company also debuted the 75 Motor Yacht and the 52 Sport Tower. Viking has introduced 15 new models in the past six years, Healey said. All of the publications in the Active Interest Media Marine Group, including Trade Only, participated in a “Meet the Editors” event on the day before the show. In sessions with editors, marine companies made PowerPoint presentations as they explained their latest offerings. We learned that FLIR Systems is introducing three Raymarine VHF radios and is coming out with its own electrical switching control system. The products will hit the market in January, says marketing director Jim Hands. The new radios are the Ray70 ($649), Ray60 ($299) and Ray50 ($249). The Ray70 is a multifunction VHF with GPS and AIS receiver, loudhailer and intercom. The Ray60 has all of the features of the Ray70, but no GPS or AIS, says Hands. The Ray50 is the “lower-cost, space-saver” radio, Hands says. All of the radios boast easy-to-read LCDs with red backlighting and simple operation with intuitive icons and menus, he says. The Raymarine Digital Switch Control System “can control pretty much everything on the boat with a switch on it,” Hands says. Raymarine was expected to formally introduce the product at the Sea Ray Yacht Expo in December, Hands says. Raymarine is working with the makers of Empirbus NXT, the Swedish company Trigentic AB, to produce its product, Hands says. The system was installed on a Sea Ray 350 SLX that was on display. In addition, Raymarine has released LightHouse II Version 12, the latest quarterly upgrade for Raymarine multifunction displays. New in this release is support for a quad-split video display of connected IP video cameras. Raymarine users can now view and record four live camera streams simultaneously, as well as capture snapshots and video with a touch of the MFD screen. We met with representatives of another big player in marine electronics — Navico, which owns the brands Simrad, Lowrance and B&G. The company aggressively promoted its Simrad and B&G ForwardScan, a forward-looking echosounder technology. 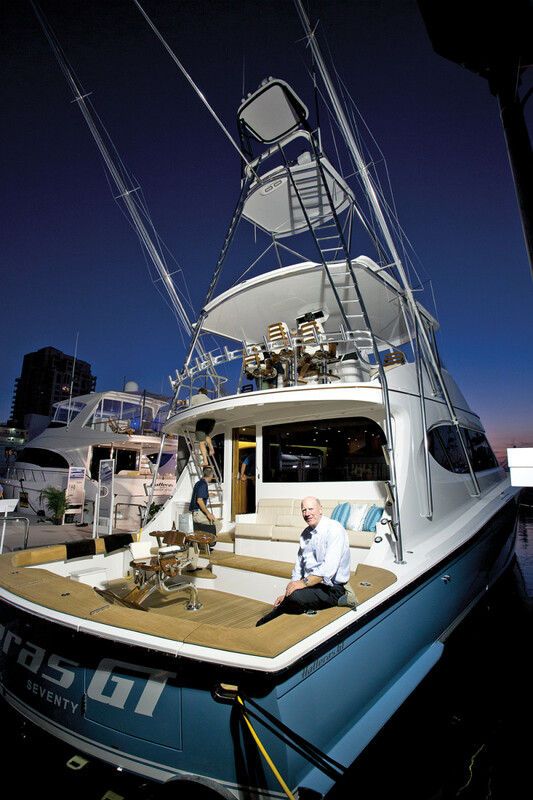 Hatteras top executive John Ward aboard the new GT70. Designed for boats of all sizes, the ForwardScan transducer can be fitted on almost any kind of vessel. Its range can be as much as eight times the actual water depth. The typical range is four to five times the water depth, Laster says. This advanced sounder technology is compatible with the Simrad SonarHub sounder module and the Simrad NSS evo2 and NSO evo2 series navigation systems. ForwardScan images can also be viewed on a smartphone and viewed and operated from a tablet on vessels equipped with Simrad GoFree Wi-Fi. The product includes only four components — the ForwardScan transducer, a stainless sleeve, a blanking plug and a fairing block. ForwardScan is also offered through Navico’s B&G brand and is available with the B&G Zeus 2 display. Navico’s Lowrance brand also offers a variation of the ForwardScan technology, but this mechanism gives anglers a 360-degree view of the bottom. It’s called SpotLightScan. For the past three years or so, there’s been an explosion of new non-pod-drive joystick helm control systems, including joysticks for inboards and outboards. Depending on the system, they can work with or without thrusters. Some of these products allow you to retrofit a boat with a joystick system. Case in point is the Yacht Controller JCS — Joystick Control System — from Yacht Controller LLC. The Coral Gables, Fla., company debuted its wireless joystick, “Fusion,” at the show. It fuses all docking controls into a single-handed remote unit with a mini-joystick knob and buttons for low-speed operation, using the inboards and bow and stern thrusters. It can also control as many as two anchor windlasses and even gangways, garages, cablemasters, cranes and tender lifts. The Fusion is the progression of the original Yacht Controller remote, which had no joystick, and the Yacht Controller JCS — a helm-mounted joystick control. The versatility of the Yacht Controller — whether fixed-mount or wireless — gives the skipper precise control of the boat at low speeds, says company president Gerald Berton. For instance, by simply pressing and holding a button above the joystick you can engage the bow or stern thruster exclusively — using the joystick — to quickly nudge the boat to port or starboard. Release the button and joystick operation returns to normal mode, using engines and thrusters. Yacht Controller products were installed on about 40 brands of boats at the show, says Berton. “We’re on Marlow, Hargrave, Horizon, Hatteras, Princess, Pershing, Ocean Alexander and 150 other brands — you name it.” The JCS system is about $16,000, which does not include the thrusters or installation costs. Add $2,500 for the Fusion remote. Yacht Controller also introduced its “cost-effective” Sport Joystick for center console boats and small yachts, Berton says. This helm-mounted system also teams the engines and the thrusters for low-speed operation, and a wireless handheld remote (with buttons only, no joystick) can be ordered as well. The weather was at its South Florida best and traffic at each of the seven venues was brisk. My takeaway from the show was how much it feels like 2007 again, with big boats selling, truly engaged buyers and sellers and an incredible wave of new product and innovation. Yet the exhibitors I spoke with seem well aware of the fragility of the industry’s steady crawl back from the abyss. Galassi is part of a new management team charged with leading the Italy-based Ferretti Group after it was acquired in 2012 by the Chinese manufacturing company Weichai Group. The Ferretti Group showcased 15 new yachts across four of its brands along the Face Dock at the Bahia Mar. Galassi says the plan is to introduce at least four new models in 2015, including an 88-foot Riva at next year’s FLIBS. James Henderson, president and CEO of Ferretti Group America, says the key to success for international builders such as Ferretti in the attractive North, South and Central American markets is new product. “For the Americas, it’s our fifth year of growth and another record year for new-boat sales — and our brokerage sales are up about 20 percent this year,” he says. Another international player that is focused on the Americas is Beneteau, the French builder known for its sailboats. The group launched a business plan to rapidly grow its powerboat market several years ago. One of Beneteau’s brands, the French-Italian yacht builder Monte Carlo, introduced two models — the 86-foot MCY 86 and the Mediterranean trawler- inspired 45-foot MC4. The U.S. focus seems to resonate. The 86 on display had already been sold by Denison Yacht Sales, Monte Carlo’s exclusive dealer in the United States, and will be home-ported in Florida. The international builders I spoke with confirmed that the Americas remain the most attractive market globally, especially with the European and Asian economic recoveries losing steam. And although high-income buyers fared much better through the Great Recession, they had been reluctant to spend on luxury yachts until the past couple of years. Custom builder Benetti introduced the Veloce 140, the first model in the Fast Displacement Class from the Italian builder. The impressive 140-footer has a fine interior, complemented by an innovative “displacement to plane” hull and advanced propulsion, as well as a proprietary touch-screen wheelhouse and an electronic stabilizing system. The custom yacht was built and sold for an undisclosed price to a buyer in Brazil. Another custom Italian builder, Sanlorenzo, continues its push into the U.S. market (this was its sixth straight FLIBS appearance) with the debut of the SD112. Built for an American owner, the 112-foot trideck motoryacht on display, hull No. 1 and named “O,” features a raised pilothouse design that includes a Jacuzzi tub surrounded by sunpads on the top deck. The company says it has sold six SD112s. But innovation and new products were not strictly left to European builders. Fort Lauderdale-based Outer Reef Yachts used the show to announce a departure from its expedition and motoryachts with the forthcoming Trident Series of fast trawlers. The Trident 550 is being built in Croatia for a 2015 launch, and 650 and 750 models will follow. Each will use a combination of pod drives and traditional propulsion. The yachts feature a synthesis of style, innovation, technology and functionality. The builder says the plumb-bow, resin-infused hull is designed to perform equally well at 8- to 10-knot displacement speeds and 18- to 20-knot cruising speeds. Top end will be 28 knots. Engine manufacturer BRP used the show to launch its head-turning new outboard, the G2, the second generation of the manufacturer’s E-TEC line of 2-stroke outboards. The angular profile of BRP’s first totally new outboard in 38 years is designed to draw attention to the sophisticated engineering inside. A titanium-oxide coating over aluminum parts enables Evinrude to offer a standard five-year corrosion warranty and no scheduled dealer maintenance for the first 5 years or 500 hours of use. Evinrude E-TEC G2 200-, 225-, 250- and 300-hp models debuted at several locations, including the Broward County Convention Center. Behind the nearby Hilton Fort Lauderdale Marina, a Key West 239 was rigged with a 250-hp G2 and an Andros 32 was powered with twin 300s. 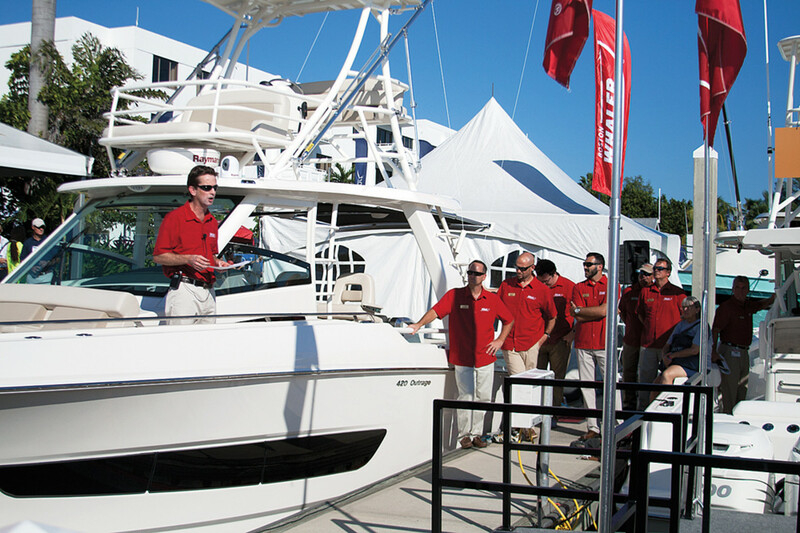 Eckman says Evinrude had its biggest presence ever at this year’s FLIBS. He says that at the display in the convention center, people were doing a double-take at the unique-looking outboards. Innovation also could be found among electronics and gear manufacturers. Garmin Ltd. introduced a roster of new products at the show: integrated multifunction displays, versatile sonars and transducers, autopilots and radar — all designed to be more intuitive to operate and install. The new GPSMAP 700 Series and echoMAP plotters and sounders are loaded with integrated features. The black-box GSD 25 sonar module includes true dual-channel 1 kW CHIRP, plus CHIRP SideVü and DownVü scanning sonar (transducers sold separately). The new GHP Reactor autopilot systems borrow from Garmin’s aviation wing and compensate for pitch and roll. Garmin in July purchased Fusion, the New Zealand manufacturer with an entertainment electronics product line focused solely on the marine market. Fusion used the show to introduce several new products, including a black box entertainment system with Bluetooth audio streaming and multi-zone technology. Imtra’s new Sigma PowerLEDs are a straightforward, dimmable LED upgrade for marine halogen down-light systems. They’re designed for installation in existing fixture locations and cutouts to make full-featured retrofits easier and geared to the aftermarket segments. Sigma PowerLEDs use a boat’s two-wire cabling and are compatible with many popular halogen dimmers, as well as dimmers from Imtra. The Sigma line is engineered to minimize hum during dimming and reduce electronic interference (RFI and EMI) with on-board systems. Co-founder and president Chris Rollins brought with him more than 30 years of marine desalination experience when he started Blue Water Desalination just a year ago. The company showcased its three lines of watermakers, including its new Legend series, and says that two additional lines will debut at the Miami International Boat Show in February. Touting innovations such as automatic freshwater flush, which extends the life of a membrane from three to six years, Rollins says the challenge in his market segment is to continually strive to make products smaller and quieter. Pettit Marine Paint’s new water-based antifouling paint, Neptune 5, is priced for do-it-yourselfers at $110 to $129 a gallon. The company says the self-polishing paint has no strong solvent smell, and its user-friendly application requires no respirator or sanding between coats. It cleans up with soap and water. Available next spring, Neptune 5 will be offered in black, blue, green and red at marine stores and boatyards throughout the United States. 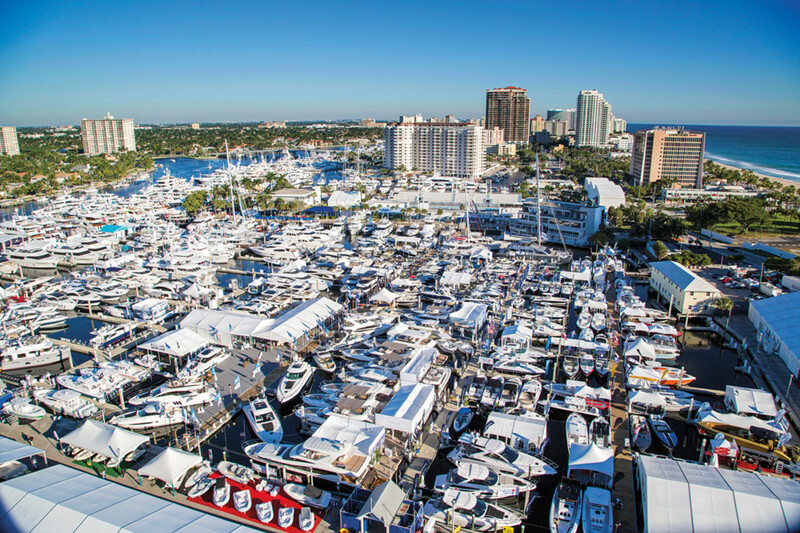 I arrived in Fort Lauderdale the day before the show officially opened and was able to see firsthand what a massive undertaking it is to set up the largest in-water boat show in the world. Although the in-water boats were already set, U-hauls and large multi-axle trucks lined A1A for long stretches, waiting to unload their displays, signs and setup materials. The areas around the Hall Of Fame Marina, Bahia Mar Marina and the stretch along Florida State Road A1A near the Bahia Mar loading zone were particularly chaotic. After studying the MyBoatShow app and all online boat show parking suggestions, I did a drive-by of two lots within walking distance of the Bahia Mar, scouting out parking for the next day. The next morning I arrived at the beach a few minutes after 7 o’clock and just barely got a spot in the 100-car lot. The lesson here, for anyone intending to attend in 2015, is to plan where you’re going to park, know the options if those spots are full and know the transportation options between venues. Although the show was well served by buses, shuttles, water taxis and a riverboat, most of these services were offered within the hours of the show. Early-morning events left reporters scrambling for parking and taxis. The “customizability” of boats and products was a reoccurring theme this year. Sea Ray introduced the first boat in its new SPX line Thursday morning at the convention center, touting a boat designed for a family of four with a base price below $26,000. The SPX 19 and 21 have hundreds of options, including the choice of a sterndrive or outboard power. The price tag for the boat on display at the booth was $34,900. Sea Ray’s new 2015 Sundeck is available in 27 and 29 feet, both with sterndrive or outboard options. 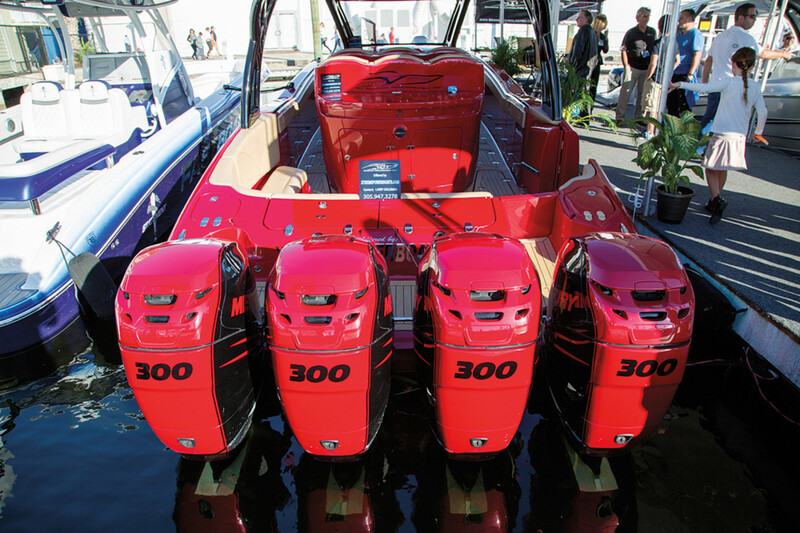 The 270 Sundeck at the show was displayed with a Mercury 300 Pro outboard. The Sundeck series prices range from $84,995 to $97,700. Analytics showed that the online articles on Sea Ray’s new models received heavy traffic for a week, perhaps indicating a strong interest in these new, customizable models. Everglades Boats introduced its largest vessel to date, the 435CC, Thursday morning at a press conference I attended at the convention center. The 45-foot luxury model adds at-home amenities to a fishing boat with its flat-screen TV and DVD, standing shower and fully equipped head. Interior seating in the small cabin converts to a queen-sized berth, and the designers have added a custom etched-glass partition. The Everglades 435, with its four 350-hp engines, is part of the new class of center console boats that feature four outboards. Williams Tenders also introduced a new customizable product at the show, the new Sportjet 460, a 15-foot jet tender powered by a Rotax 4-TEC 150 engine. The Sportjet 460 is designed to serve as either a standalone boat or a high-end yacht tender. The 6.3-foot-wide, diesel-powered center drive Sportjet comes standard at $52,950 and is highly customizable, with options such as a chart plotter, LED deck light and a Fusion music system, sending the price tag up to $56,632. The Sportjets are available in four colors. After the Sea Ray and Everglades press conferences, I stopped by the Marine Industries Association of South Florida job fair at the convention center. The fair featured more than 20 marine industry companies from the private and commercial sectors, representing nearly 200 available positions, including skilled trades, administrative and crew. Fort Lauderdale is a major cruise ship port and a good starting point for those looking for work aboard cruise ships. Fort Lauderdale-based Maritime Professional Training, one of the largest private maritime training schools in the United States with courses that include Coast Guard captain’s licenses, steward training and onboard firefighting, was at the fair. The MIASF is the largest trade organization in the Southeast. It estimates that there are 90,000 middle-class jobs in Broward County and 107,000 jobs regionally in marine businesses. 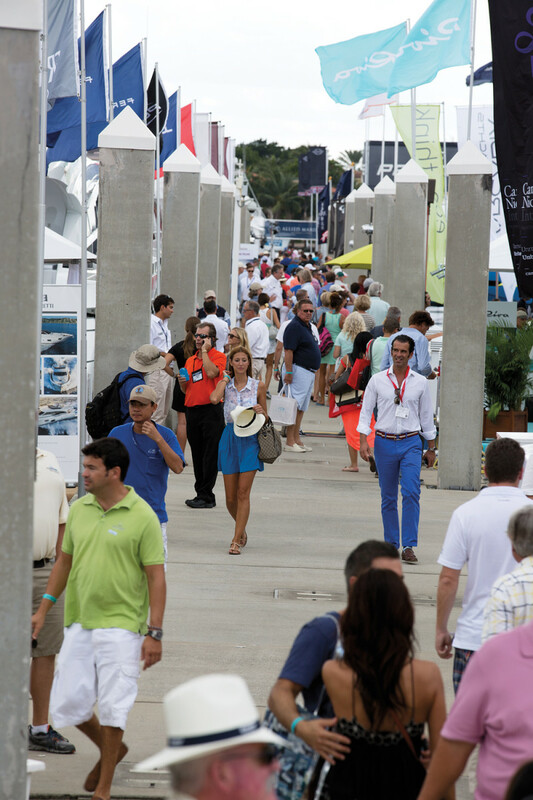 Marine businesses contribute $7 billion to the economy in Broward County and $8.9 billion regionally, according to the MIASF, which owns the Fort Lauderdale show. The Marine Marketers of America luncheon on Thursday opened with a short but captivating presentation by two members of ACR Electronics’ Survivor Club. Two club members told of their rescue at sea, a rescue they say was made possible by their ACR EPIRB. Ed Cantú, keynote speaker at the MMA luncheon, drove home the need for marine industry businesses to have a marketing plan aimed at the emerging Hispanic market. Cantú is the director of consumer insights and planning for Lopez Negrete Communications, the Houston-based marketing firm hired by the Recreational Boating and Fishing Foundation to develop a five-year Hispanic market outreach plan.